As school lets out for summer, AAA stresses the importance of preparing and educating inexperienced teen drivers for some of the most dangerous driving days of the year. 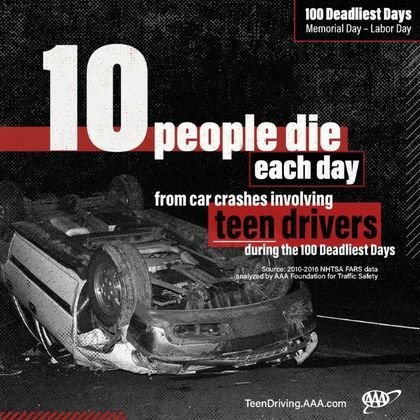 More than 1,050 people were killed in crashes involving a teen driver in 2016 during the 100 Deadliest Days, the period between Memorial Day and Labor Day. That is an average of 10 people per day – a 14 percent increase compared to the rest of the year, according to data analyzed by the AAA Foundation for Traffic Safety. “Given the danger that speeding and nighttime driving present to teen drivers, we recommend parents be actively involved in their teen’s learning-to-drive process,” continues Podguski. Discuss with teens the dangers and consequences of distracted driving (i.e., texting, having multiple people in the car, etc. ).